Better World Books offers a wide range of products and services at incredibly low prices in Australia. These Better World Books promo codes expire soon, so don’t forget to bookmark this page now. Better World Books free delivery offer: Better World Books provides free shipping service on all your orders. Exclusive Better World Books voucher codes: Save 39.9% on Silent Spring book which is based on environmental science. Limited time Better World Books coupon: At Better World Books, you will get new & used audio books starting from $3.98! Seasonal Better World Books deal & sale: Get Plastic Ocean used book from Better World Books, available for just $7.98! New Better World Books discount: Purchase any 2 used bargain bin books for just $30 from Better World Books. 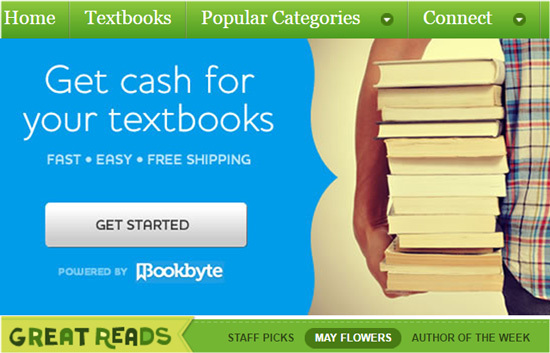 Better World Books founded in 2002 it is one of the leading online bookselling stores. Started by three friends to earn some money, the business was soon transformed into an established social enterprise. The sole aim of the business is to promote literacy. The company believes that education is the fundamental human right. Apart from selling new titles, the company even supports the book drives to collect the used books through the network of over 3000 libraries and 2,300 college campuses. The company has more than eight million new and used titles in stock and thus is a self-sustaining company that creates social, environmental and economic value for all the stakeholders. The company has recycled or re-used more than 216 million pounds of books and raised over $18 million for local libraries and global literacy. 10% off on 2 or more books. Shop the Bargain Bin: The more you buy, the more you save. Buy used books for up to 90% discount. Free shipping on selected books. Textbooks: Here you can find textbooks for major subjects like accounting, calculus, computer science, economics, history, maths, medical, philosophy, and biology. Popular categories: Autobiographies, antique, rare & collectible books, art books, architecture books, biographies, Children’s books, economics and business books, crime books, computer and technology books, graphic novels, comic books, design books, classic literature, garden and home books, funny books, fiction, history books, medical books, newspapers and magazines, photography books, family and parenting books, religion books, science fiction books, romantic books, current events Books, self-help books, travel books and Social Science Books. Staff Picks: The staff recommends some great reads that a book lover must read. Category: The staff recommends some popular categories and books keeping the season, month, or festival in consideration. Author Of The Week: Here you can find the books for the best-selling authors. Literacy Partners: Books for Africa, Room to Read, National Center for Families Learning. At Better World Books you can refine your search by: Condition, Categories, Price range, Format, Ratings, Language. If you want to go for more collection of ebooks, do not miss to check out our books, music & video category. Use our exclusive coupon codes and explore your reading habit. Libraries: If you are already a partner, just log into your client portal and schedule a local pickup for your books. Individuals: Locate the handy book drop boxes at your nearest location and donate your books. Bookstore Partner: If you are already the partner login to your personal client portal and schedule for the local pick up for your books. You can view the promotional materials and the environmental impact of the collected books. Book Drive Partner: If you are already a partner, just log into your client portal and request for the pick-up for your books. On the order page, there is a ‘Coupon Code’ box. 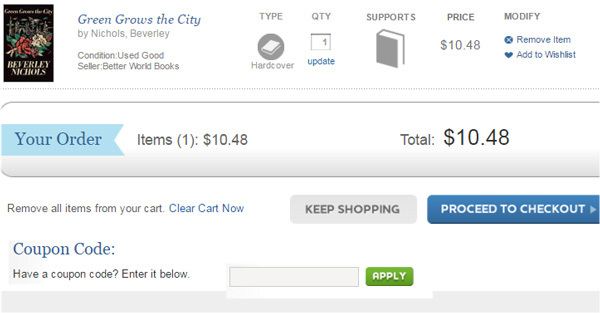 The discounted amount will reflect in the cart. You can give the gift of reading by using gift certificate. You can easily find the gift cards for $10 and up. You can buy the gift certificates of value from $10 to $100. The gift certificate will be e-mailed to you which you can either print or e-mail to the recipient. You can use the gift certificate on the billing and payment options. Under the ‘Payment method’ click the ‘Gift Certificate’ button as your preferred payment method. Paste the gift certificate code in the box and click ‘Apply’ the balance of your gift certificate to your order. In case the amount is more than the gift card value, you can pay the balance using credit or debit card or Paypal. Our books, sales, and programs: Book for book program, All about our books, Donations from Better World Books, Donations to Better World Books, BuyBack, Drop Box donation program, Purchase orders, Bulk orders. Where is my Book: I haven’t gotten a shipping confirmation, My order has not yet arrived (International), My order has not yet arrived (US Territories). I have placed my order: Returns, Address change, Adjust or cancel order content, Order issues. You can find the videos by the company at vimeo. Here you can find videos about the people, mission and business model of Better World Books. This video is about the information of Better World Books. Standard: The shipping is free and average delivery time is nine days. Expedited: The shipping is for $3.97 and average delivery time is three days. 2nd Day: The shipping is for $9.97 and average delivery time is two days. Next Day: The shipping is for $21.97 and average delivery time is one day. For international orders, the delivery time ranges between 10 to 21 days. Booktopia is also an Australian-owned book seller, which offers books, eBooks, DVDs and more with up to 90% discount and free shipping service over 160 countries. The company accepts the return within 60 days of purchase date. You need to include a short note stating the reason for return and your order number. Simply package the book and sent it back at: 55740 Currant Rd, Mishawaka, IN 46545, USA. The refund is initiated only once the company receives the return. In the case of new book return, the book must be unused to get the return.